Military debris dumped into the world’s oceans are hazardous to coral ecosystems, reefs, fish and marine wildlife, say experts, who also warn - in light of the recent tragedy in Japan - that earthquakes and tsunamis could disturb this debris and even wash it ashore. 'The tsunami from the Japan earthquake increased the likelihood of sea dumped conventional and chemical weapons washing ashore as they rest at a shallow depth of 200 metres in Choshi Bay of Chiba Prefecture in Japan,' said Ryo Sato, marine researcher at Global Green, the U.S. affiliate of the NGO Green Cross International. The Baltic Sea, North Atlantic Ocean, Mediterranean Sea, and Pacific Ocean are hotspots. In the Philippines 'Coron, Subic Bay and Leyte Gulf have the highest density of planes and ships sunk during the Second World War, and numerous shipwrecks and airplanes litter the seafloor in the reefs,' according to the World Wide Fund for Nature (WWF), Philippines. 'The U.S. Army dumped over 8,000 tonnes of chemical weapons off Hawaii,' said Paul Walker, director of Global Green, at the recently concluded Fifth U.N. International Marine Debris Clearance conference in Hawaii. Around 300,000 tonnes of chemical warfare agents were dumped in oceans from 1946 to 1965. Upwards of 400,000 gas filled-bombs and rockets float in U.S. waters. 40,000 tonnes of Conventional Weapons (CW) are in the Baltic Sea. 21,000 tonnes of CW agents float in Australian waters, and more than 6,600 tonnes off the coast of Japan. 'Marine debris... adversely impacts marine life, destroys habitat and entangles food for marine organisms and seabirds,' says Finn Longinotto, senior programme fellow at Global Green. France conducted 137 undersea nuclear tests between 1975 and 1996 in French Polynesia creating an artificial crater 140 metres in diameter - disturbing one million cubic metres of coral and sand. The explosions injected nuclear material into the carbonate rocks that will be released gradually into the ocean. Earthquakes and undersea landslides will intensify release of the radioactive material, affecting seafood, ocean currents, and rain bearing clouds around the whole planet in the long term. Residual nuclear material is negligible according to a study initiated by the International Atomic Energy Agency (IAEA) at the behest of the France in 1998. According to a study undertaken by the University of Florida, missiles, torpedoes, and submarines emit sonar waves leaving cetaceans like dolphins, dugongs and whales hearing impaired - affecting their hunting ability, group communication, migration patterns, and mating behaviour. India’s armed forces have also destroyed fragile marine habitat and coral ecosystems. In the Bay of Bengal, India’s Defence Research and Development Organisation (DRDO) conducts missile tests in the middle of a turtle-nesting site within the Gahirmatha Marine Sanctuary. 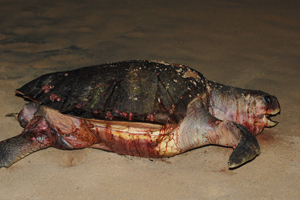 'DRDO is not supposed to carry out missile testing during the turtle nesting season. However, they flout this rule despite regular forest department objections,' charges Biswajit Mohanty, of the Wildlife Society of Orissa. The DRDO 'have not disclosed the nature of debris littered in the sea,' Mohanty added. 'The flares emanating from missile launch heat the habitat, and disorient the turtles and hatchlings especially when they head to the sea,' says a concerned Mohanty. Netrani Island’s fauna includes the white bellied sea eagle, corals, coral fish, whale shark, tiger shark, giant groupers, giant clam, dolphins, sea snakes, crustaceans, reef sharks, stingrays, squid, sea cucumbers olive ridley turtles, jelly fish, sea urchins, killer whales and edible nest swiftlets. The island is the only place outside of the Andaman Nicobar Islands where edible nest swiftlets live. 'Who is the enemy for the Indian Navy to bombard unarmed wildlife?' asks K. S. N. Cikkerur, the additional director general of the police forest cell of Karnataka, in Bangalore. Is the enemy the rare 'Schedule One species listed in the Wildlife Protection Act?' Cikkerur wonders.